Developing countries tend to use both targeted and general incentives to attract investors. Such incentives may be included in tax laws, financial regulations, investment laws, government directives and the likes. The mere fact that tax incentives do not require upfront use of government funds makes them a preferable option for developing countries, unlike developed countries that are generally more open to grants or subsidized loans. In line with the above, Nigeria passed the Venture Capital (Incentives) Act Cap V2, LFN 2004 (“The Act”) which was enacted for the sole purpose of granting additional tax incentives to venture capital and start-ups generally. However, the structure/mode of operation of a start-up is a major determinant of which and what benefits are applicable to such entities (kindly seek professional advice for clarity). 1. Pioneer Status: This exempts an organization from paying company income tax for a period of 3 years. The privilege can be extended for an additional 2 years, making a possible total of 5 (five) years of tax exemption. 2. 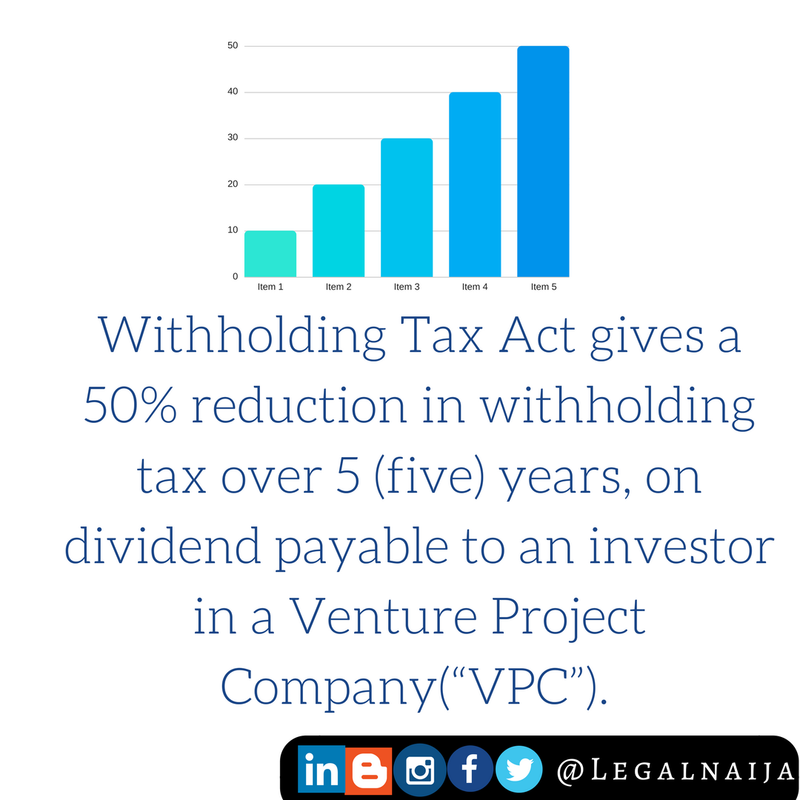 Withholding Tax: The Act gives a 50% reduction in withholding tax over a period of 5 (five) years, on dividend payable to an investor in a Venture Project Company(“VPC”). 3. Capital Gains Incentives: This is a reduction in the amount payable as tax on the profit made when disposing an asset that has increased in value. 5. Export Incentives: Start-ups that qualify (in accordance with the provisions of the Act) will be able to access export incentives such as financial assistance from the Export Development Fund as well as benefit from the export expansion grant and the export adjustment scheme fund. 1. Venture Project Company under the Act: A VPC is defined as one established for the following purposes (a) The acceleration of industrialization by nurturing innovative ideas, projects and techniques to fruition (b) The commercialization of research findings with high potentials for far-reaching forward or backward linkages (c) The promotion of self-reliance through the establishment of resource-based and strategic industries through the provision of risk guarantee and insurance (d) The encouragement of indigenous process and technologies (e) The promotion of the growth of small and medium scale enterprises with emphasis on local raw materials development and utilization (f) such other objectives as may from time to time, be specified by the FIRS. A VCC must also be established for the foregoing purposes to be eligible for the incentives provided for under the Act. 2. Share Capital Threshold: The Venture Capitalist must acquire not less than 25% of the total capital required for the project. 3. FIRS Certification: The Federal Inland Revenue Service is the agency responsible for administering the incentives under the Act and generally has the power to determine whether a company is capable of fulfilling one or more of the incentives. Companies who intend to take advantage of the incentives under the Act must obtain the accreditation of the Federal Inland Revenue Service. In as much as the intent of the Act might be commendable, there is a large room for improvement on what presently obtains. One of the various steps that should be taken includes expanding the scope of VPC and a general review to capture present business realities.